Following the successful Dance Writers of the Future project initiated by Ballet in Small Spaces in 2009, Oxford Dance Writers announces a second competition to find talented young writers on dance. This year's competition focuses on Dancin' Oxford 2012, whose programme of exciting dance events, activities and performances from 18th February to 28th March provides multiple opportunities for reflective writing and critique. * Entrants are asked to submit a piece of original critical writing about an event taking place as part of the Dancin' Oxford 2012 programme. This could be a review of a performance, an account of a workshop experienced, discussion of a talk or conference presentation etc. * Length to be approximately 400 words. * Entries to be sent to Susie Crow of Oxford Dance Writers either by email, or hard copy by mail – see contact details below. Please include with your entry your full contact details, including postal address, telephone and email, also date of birth. Incomplete submissions cannot be accepted. * Deadline for submissions 5.00pm Monday 2nd April. * A panel of experienced professionals will judge entries and select winners in two categories; under 18 years and 18-22 years. * Prizes will include pairs of tickets for forthcoming dance performances in Oxford including Matthew Bourne's Nutcracker at the New Theatre, and joint subscriptions to Dancing Times and Dance Today. * A selection of entries including the winners will be published online on the Oxford Dance Writers website, and the competition will be publicised in Oxford Times and nationally through Dancing Times who will publish two winning entries online. Over spring term 2009 students have been encouraged to develop their critical and writing skills in reviewing dance performances in Oxford,beginning with The Solos Project in January andcovering the events of the Dancin’ Oxford Festival. This project has involved groups studying GCSE Dance, National Diplomas in Dance and Performing Arts, also BA Performing Arts students and undergraduates with an interest in arts and journalism. It is led by Michael Levy, Oxford University Drama Officer, and Susie Crow of BiSS, and ongoing reviews can be found on the Oxford Dance Writers blog. Emma Dougan is studying English Language and Literature at Worcester College University of Oxford. In writing she specified that her review was intended for “online publication, not necessarily aimed specifically at a dancing audience, possibly included in general arts reviews”. "The boundary of the BT’s black walls was just one of many aspects of the medium explored in tonight’s performances by locally-based artists. The focus provided by the ‘small space’ shone a spotlight on the potentials of facial expression, the spoken word, costume, and indeed, the spotlights themselves. Hannah de Cancho made use of the latter, for example, in the opening and closing motif of her silhouetted cycling legs. The work progressed from an earthy animalism to religious humility to striving confidence, but aside from its defining motif unfortunately lacked a certain tangibility. This cannot be said of Fiona Millward’s performance, which engaged the audience with her confiding air, and her playful use of her costume. The fluorescent piping of her ruff and hooped skirt glowed at the start and end of her performance like the Cheshire cat’s smile, holding the disconcerting note struck by her spoken questions on the purpose of entertainment. This feeling of unease was maintained by another trilogy, in which Debbie Camp burlesqued the burlesque, throwing angular postures and fruitless shimmies around the limited space in a dazzling costume, at first confidently, then frenetically, then finally exhaustedly, using the very wall of the space to support herself. Ruth Pethybridge’s panegyric to self-love had a wonderfully fey sense of humour, matched by her whimsical music choices. Like Millward, she charmed the audience with the obvious enjoyment expressed in her voice, face, and self-assured movement, and which was fully evident in her jubilant conclusion, ‘Dancing with Myself’. This accessibility made Thomas J.M. Wilson’s work all the more startling: this piece certainly deserves the description ‘off-the-wall’, but the artist clearly sought out unusual ways to contend with his medium’s aesthetics. The mask that hid his face reduced the work to a purely formal performance, and restricted his movements to lunges and twists of the legs, enforcing awareness of the space’s limitations. Carefully controlled lighting revealed only parts of the full form at a time, producing an oddly arresting, almost mesmerising effect. This was followed again by disorientating contrast, in Anuradha Chaturvedi’s shimmering Kathak performance, full of rapid spins, flickering facial expressions, and a consummate awareness of the music’s rhythms, shaken out in the bells that surrounded each of her ankles. Conjuring up an ideal sentiment to end the night, the concluding artist proved the power of a solo dancer to evoke glamour and celebration, even in these small spaces." Rachel Gildea is currently on a gap year having completed a-levels in Dance, English Literature and History and is applying to study Dance and English or Dance and Culture at university in September. She wrote her review for an intended audience of dance lovers. "Hidden away behind the bright lights of the Oxford Playhouse, the Burton Taylor Studio is one of our city’s best kept secrets. Although unprepossessing on the outside; inside, the potential of its intimate 50-seater theatre is very apparent. The soloists had nowhere to hide from the close gaze of the audience, huddled in anticipation. How well-suited, if not a little daunting for the dancers, to perform alone in such a personal setting. With dance, so often associated with collaboration, companionship, co-existence and accompaniment, The Solos Project offered an opportunity for some of Oxford’s professional dancers to step bravely forward into the limelight, revealing to us their unique, isolated worlds. The freedom of this self-expression seemed to stimulate in all the pieces a powerful undertone of self-questioning, exploration and discovery. Most openly confessional were Fiona Millward and Ruth Pethybridge, whose performances of Hoop and Love after Love both engaged the audience in a natural and honest portrayal of their relationship with themselves. Whilst Millward playfully made known her inner longing (and perhaps angst) to make the audience feel warm and happy, Pethybridge evoked the difficulty of feeling happy with ourselves. What was being suggested was that, as humans, we struggle with our complexity and ambivalence. Although we long for the limelight, we also dread it because it can expose our inner frailties. Perhaps this was most intensely expressed in Blotter, Thomas Wilson’s solo. He denied the audience any sight of himself, remaining encased in a sort of fabric cocoon. His multicoloured padded suit de-humanised him and his tall hood was eerily reminiscent of a grim reaper. The theatre was hushed and astonished as the figure moved slowly and sadly across the dimly lit stage, avoiding the lights, it seemed. The piano whimpered and induced an atmosphere of deep melancholy. For me, it was the most memorable performance. Pethybridge poignantly put into words the self as a ‘stranger you’ve known all your life’. With this, she highlighted a truth that we are alone and that we have to learn to be alone with ourselves. All the pieces were captivating in their own way. The way in which the performers were wholly and confidently true to themselves in different ways commanded my admiration. We are wonderfully, gloriously different, with all our peculiarities, strengths and weaknesses and that’s how it should be. Dance with yourself." Julia Janikova is a Year 1National Diploma in Dance student at Oxford and Cherwell Valley College. “Do not go where the path may lead, instead go where there is no path and leave a trail” by Ralph Waldo Emerson. These words indeed say what the evening is about – ‘expect the unexpected and explore the unexplored!’ This taster of 6 pieces from Oxfordshire dance artists is a definite sell-out. You could call it ‘the Oxford version of Sadler’s Wells –Sampled!’ The styles include contemporary, physical theatre and Kathak. Ruth Pethybridge reflects on Derek Walcott’s poem Love After Love and the need for self-love. Are the mugshots at the beginning referring to being prisoner in own body, trying to find a way out? Thomas JM Wilson presents himself as Blotter – a creature you love the moment you see it on the empty stage. Together with music and clever lighting he creates a powerful atmosphere you do not want to leave! This piece clearly takes physical theatre to another level. Lastly, Anuradha Chaturvedi lures you into North India. Her piece Tarana consists of intricate rhythm patterns, foot taps and fast turns – everything a traditional Kathak dance should include. This is an event when dancers, choreography, costumes, lighting and the audience all come together and create a wonderful atmosphere and a night to remember! And if you let go of your imagination completely, Fiona in her caricature costume could turn into a Snow White, and you may even hear an alien ‘Blotter’ trying to communicate with you…. This project certainly leaves a trail behind and I look forward to future productions." Katherine Rollo is in her second year studying English Language and Literature at St. Hilda’s College, Oxford University. She wrote her review as for publication in a national newspaper. "The constraints of a smaller space posed a challenge for this year’s Solo Project by Ballet in Small Spaces. An intimate space naturally emphasises smaller gestural movements and facial expressions. The problem for this programme became its failure to create unified pieces which integrated these elements with larger, more conventional movements. Hannah de Cancho’s ‘Routed’ proved a good opening in its varied use of space. Its flaw lay in the fact that more conventional ‘dance’ movements felt like mere padding to the highly-original gestural movements, which were far more emotive. Ruth Pethybridge’s ‘Love After Love’ was a superior piece in that the larger movements were developed directly from smaller, more expressive gestures. The mime of eating, for example, evocative of nourishing the self, developed into larger reaching and pulling in gestures, as if the dancer was emotionally gaining in confidence. Pethybridge’s solo also excelled in integrating dance with text. The words, taken from a Derek Walcott poem, elaborated on the theme of the relationship with the self but never overpowered the dance. The use of text in Fiona Millward’s ‘Hoop’ was less successful. There were humorous moments, particularly when the straight delivery of the monologue contrasted amusingly with the comic movements. Nevertheless, as the monologue descended into melodrama the movements became overshadowed. Ultimately, ‘Hoop’ began to feel rather self-indulgent, a criticism also germane to Susie Crow’s ‘Boom and Bust’. The rather sinisterly sexual portrayal of the burlesque in the first half contrasted well with the depiction of helplessness in the second, but in neither part did the piece manage to develop any of its motifs. Perhaps the point was to make us feel like uncomfortable voyeurs, but in this case the refusal to develop the piece made it feel like self-indulgent wallowing in emotion on the dancer’s part. Thomas JM Wilson’s ‘Solo #4: Blotter’ failed for much the same reasons. The lack of development in the movement meant that it relied too heavily on nightmarish costume and lighting to create the intended atmosphere. Overall, the pieces felt hampered either by being overly-aware, or not aware enough, of the need to please of the audience- sometimes in the same piece. The kathak-style ‘Tarana’ by Arjun Mishra was perhaps rather too illuminating an ending. Utterly pleasing to the eye, yet choreographically interesting, this piece never forgot, as the others did, the need to entertain as well as to interest." Rachel Banham is studying for a National Diploma in Dance at Oxford and Cherwell Valley College. She wrote her review as for either a broadsheet newspaper or a specialist dance magazine. “The Solos Project” had a diverse range of dance styles presented in the intimate theatre, the Burton Taylor studios. Many of the pieces were very open to the audiences’ interpretation. I found this was particularly apparent in a piece called ”Boom and Bust” by Debbie Camp and Susie Crow. Susie choreographed the piece so the dancer was “an embodiment of the stock market”, symbolising the extravagance and excess, in juxtaposition with the bleak outlook on life when all goes wrong. I however interpreted the dance differently, in the piece they used jazz piano, from the same era as the Wall Street crash. She had a motif where she traced a downwards zigzag in the air which I perceived as a representation of the graphs checked by the stockbrokers, and also representing how the economic situation is spiralling downwards into total collapse. They use the accompaniment effectively here; as the music becomes more disjointed and erratic, as does the movement. I feel that the piece shows how everyone is affected by an economic collapse, not just the stockbrokers and the businessmen, but also the showgirl, and more importantly, everyday people. We see the insecurity of the showgirl as she takes off her jewellery and her feathers, which represents the cutbacks every business seems to be making nowadays. Overall, it was an outstanding show. I was particularly impressed with the imaginative costumes and lighting designs, as they were all a vital element to the pieces. I particularly liked the lighting used in the first piece, “Routed”, where the dancer hung off the lighting rig, circling her legs as if she was running in the air, as the shadow was projected onto the wall, I feel that it gave an extra dimension to the piece. It also gave the impression of trying to run away, especially with the harmonica accompaniment, which reminded me, so much of a typical old American prison! Although this piece was based on the dancer finding her way, I felt it represented escape. I feel that the uncertainty of their pieces is the beauty of them! Everyone leaves with a different understanding of each piece, and as the audience shares that with one another, it really opens our eyes, and gives us a deeper, more meaningful understanding of the piece and the audience leave enlightened, yet still intrigued." Rosie Hore is at Oxford High School and studying GCSE Dance at East Oxford School of Ballet. She wrote hers review as for publication in a national newspaper. "Oxford’s Burton Taylor Studio, snuck into the back-rooms of The Playhouse, is seldom used for dance. Usually the premises of the one-man show or studenty drama, the 50-seater makes for an intimate setting, and the stage, surrounded on three sides by plain brick walls, leaves no space for hiding. 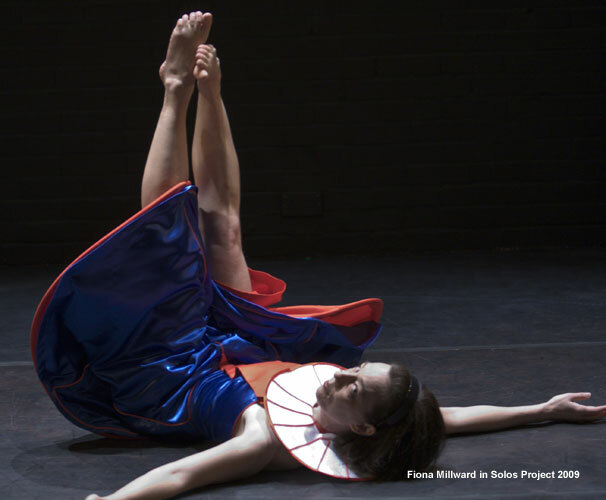 The Solos Project, arranged by the Oxford-based choreographer Susie Crow, aimed to explore the concept of the solo and the connection between soloist and audience. Unfortunately, both dance and connection were compromised by excessive costumes and lighting, which overpowered many of the solos. Dance is not a performance art that is traditionally well-funded. From the evidence shown in The Solos Project of what can happen with too much cash, maybe it should stay that way. For example, “Boom and Bust”, choreographed by Susie Crow for dancer Debbie Camp, used a vaudeville theme to symbolise the current financial climate. This could have been dance communication at its very best, but the tacky showgirl outfit, complete with cardboard box, lost it all hints of subtlety. Quite appropriately, it was the excessive budget that busted this one for me and, seated only a few metres from the performers, these gimmicky effects were completely transparent. This type dance has huge potential to push boundaries, which cannot be pushed in the larger, profit-making mechanics of larger theatres. Not to preserve all that is best about low-budget theatre proved counter-intuitive. Thomas Wilson’s piece, to give an example, was inspired by a sculpture. An inspirational starting point by any means, but there could have been so much more to it than dressing up. The Burton-Taylor, being quite literally a box, invites the performer, and the audience, to think outside of it. But by trying to be edgy, Wilson was stuck. Right in the middle of a man-sized, banana-shaped box. What was frustrating was that, after stripping away the gimmicks, the dancing was truly unique. Fiona Millward faced the audience and questioned us: “are you happy?”. It was this kind of direct, close encounter between audience and dancer that I wanted to see more of, beneath the light-up collars and fishnets. It is the imperfections of the Burton-Taylor that are its main asset, and I wanted to get to know the dancers, imperfections and all."